Dragon King · 22 · From In The SKies-Birmingham, England. Check out the new Rp thread! See if it to your liking! We need a diversity though! and dedication later! tell me whatchyu think! Hi Tasky! Are you free to RP? That's amazing! What happens in your drama? I've been about! Quite often. =D In real life, I've started my teacher's training course. I absolutely love it!!! Teaching is incredible. What have you been up to? Hey! How are you? You haven't posted on here in ages! Well things are fine but tougher now I'm in year 11. I got two A*s and two A's and a B in English Literacy . How about you? We have indeed! How are things? Lirael! Nice to see you again. We've both changed our names then. You're back! I haven't seen you in a while. 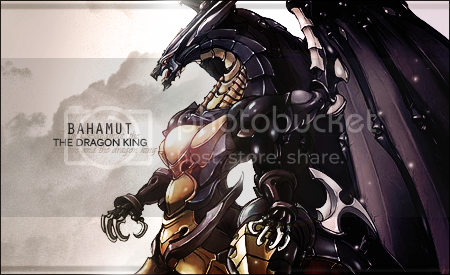 http://i1116.photobucket.com/albums/k563/CidXIII-2/bahamutsigver3.png [/IMG<---add a ] here.